in 2011, i made a new year’s resolution to spend facetime with every one of my then 325 facebook friend within the calendar year. it was an adventure and in one 17 day period, i circumnavigated the globe and visited friends in 11 countries. 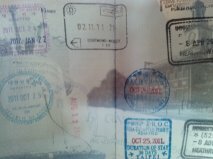 my passport is a mess. so how do you pack for a month long trip? i do it in two bags, one that serves as my office and one for my clothes. i buy hanes three pack t-shirts and good news is that they are cheap enough that i consider them disposable. i am a huge fan of reversible clothing. i like baby wipes for everything, including the inevitable disasters. . . .
i always take with me my william clark doll. william clark was a fearless adventurer, famously traveling from st. louis to the northwest coast with his friend merriweather lewis and the lahmi shashone woman sacajawea charbonneau. i bet he was a big believer in baby wipes, especially since sacajawea had her son jean-baptiste with her! some of my friends are very much like me and are afraid to leave the house. jeez, i spent most of my life with anxiety attacks that kept me trapped in my house. in the year 2011, i learned to get out of the house. when someone asks me how i did it, it’s very simple: you have to make your car your home. you have to make your seat on the plane your home. you have to be exactly where you are and make that part of the universe yours. you are entitled to peace and calm and a sense that you are welcomed by everyone. This entry was posted on Saturday, August 16th, 2014 at 6:22 pm	and tagged with agoraphobia, canada, comfort, dog chapman, facebook, passports, travel and posted in Uncategorized. You can follow any responses to this entry through the RSS 2.0 feed. thanks so much! my house is speeding along i-35!